I post to show that almost all sporting events that I know of are losing fans. I have no idea why they are but it is what it is. The author below seems to think he has the answers,. 70 million is a 15 year low. I know one sport that would kill for a 4% loss of interest each year. The question isn’t who is losing but at what rate. Regarding interest in most sports being down this is what I found in about 2 minutes. NFL TV ratings dropped from 2010 to 2017 but apparently are up this year. NBA attendance has broken records for 4 consecutive years and viewership is up 8% this year. Obviously the above just scrapes the surface but I think it shows that in terms of fans the NBA and NFL are not hurting. The only World Series with fewer average viewers were Philadelphia's five-game win over Tampa Bay in 2008 (13,062,000), San Francisco's four-game sweep of Detroit in 2012 (12.7 million) and the Giants' seven-game win over Kansas City in 2014 (13,825,000). The rating was the third-lowest, ahead of only a 7.6 in 2012 and an 8.2 in 2014. Add it to the list. FOX has already dissolved partnerships with IMSA and the WEC this year as well. I'd be surprised if Fox renews with NASCAR at this rate. They're looking like ESPN did a few years ago, dropping motorsports left and right. Honestly, I wouldn't be surprised if the next contract was either ESPN and NBC or just ESPN. A rare marquee matchup breathed life into ESPN’s Monday Night Football ratings. Chiefs-Rams scored an 11.3 overnight rating on ESPN’s Monday Night Football last night, up 57% from last year (Falcons-Seahawks: 7.2), up 40% from 2016 (Texans-Raiders: 8.1), and the highest MNF overnight since Week 8 in 2014 (Washington-Dallas: 12.1). The previous high over that span was a 10.7 for Cowboys-Lions in Week 16 two years ago. The previous high this season was a 9.1 for Chiefs-Broncos in Week 4. The Rams’ high-scoring win, which peaked at a 12.5 from 11:45 PM ET through Midnight, delivered the highest Week 11 Monday Night Football overnight in 13 years — since Vikings-Packers on ABC in 2005 (11.4). Chiefs-Rams ranks fourth among sporting events on cable in 2018. 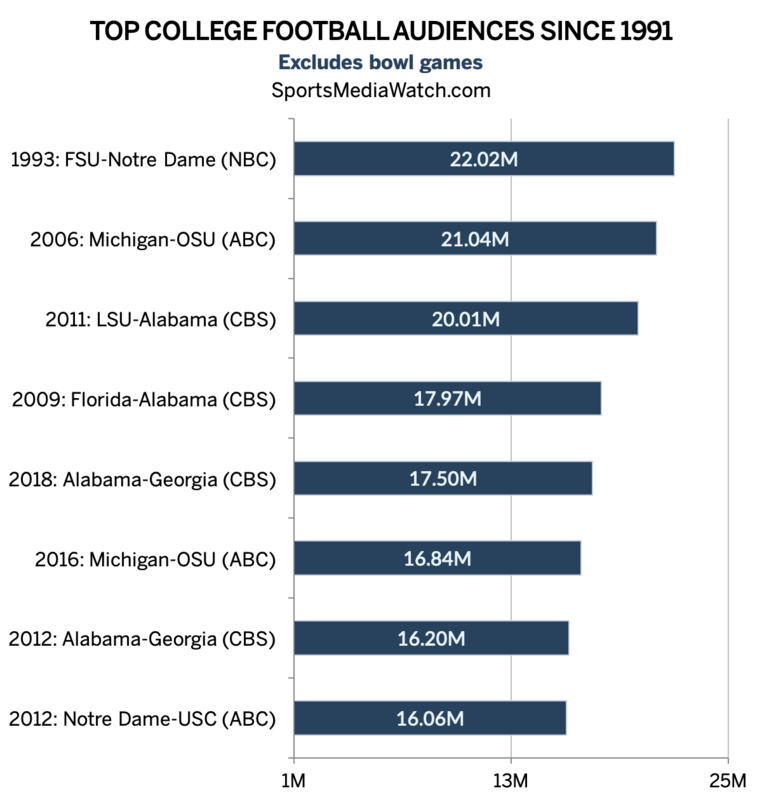 The three College Football Playoff games on ESPN hold the top spots. It ranks ahead of the Villanova-Michigan NCAA men’s basketball championship last April, which aired on Turner Sports (10.3), as well as Game 7 of the NBA’s Warriors-Rockets Western Conference Finals on TNT (10.3) and Game 7 of the Cavaliers-Celtics Eastern Conference Finals on ESPN (9.1). Notably, the 11.3 topped four of this year’s five World Series games on over-the-air FOX and the NBA Finals Game 4 clincher on ABC (11.2). ESPN’s telecast had a 16.6 rating in Kansas City and a 10.4 in Los Angeles. Simulcast coverage on local ABC affiliates earned a 36.2 on KMBC in Kansas City and a 9.2 on L.A.’s KABC. The simulcast figures are not included in ESPN’s national results. New Orleans was the top neutral market with a 21.4 rating. San Diego (16.2), Denver (15.7) and Seattle (15.5) followed. Check out those monster local ratings in KC as well, and the high local numbers in rival NFL markets for both teams. That's what happens when you become too political instead of reporting sports. What do you mean by too political? Not picking just wondering. I live in Canada so i dont get ESPN on tv but i use their website everyday. I don't want to get this moved to the podium or anything, but lets just say they went too far left. The lower World Series ratings didn’t seem to hurt MLB and the NBA is in great shape. Even the little NHL is doing well with Seattle set to join the league in a couple of years. Vegas just joined and paid 3/4 of a billion for a franchise and Seattle will spend a billion. What do you think it would cost to by a Nascar charter? I'm surprised that you are dismissive of ratings declines... being the preacher of the sermon about how the numbers don't lie. Perhaps you don't believe them, Nielsen has an agenda, etc. It's also odd that you would compare an NHL franchise to a Nascar charter, as these two things are not similar. The mainstream stick-and-ball sports have much greater popularity than a niche thing like auto racing. The "Big 4" mainstream sports have enormous advantages built in... their plug-and-play athlete development system funded by taxpayers from a young age; the "home team effect" that fuels their popularity; continual coverage by mainstream media; and an ownership league structure that turns all that into cash flow for the franchise. If those things make it better for you, then have at it. OTOH, fans of racing are comfortable in a niche situation. They tend not to need the mainstream crowd to validate their opinions about what they like. Lewis! I wasn’t dismissive about MLB’s ratings I just said it didn’t hurt them. Read about the contract they just signed and it should be self explanatory but fingers crossed! The NHL is a niche sport but they demonstrate that being a niche sport isn’t synonymous with plummeting popularity. Maybe we will have to rename Nascar a micro niche. Kinda catchy eh? Despite a slight bump on NBC, NHL viewership hit a multi-year low in the regular season. NHL regular season games averaged 417,000 viewers across NBC, NBCSN and NBC’s digital platforms, down 12% from last year (474K). As noted by Sports Business Daily, it was the lowest average since at least 2010-11. Though viewership declined overall, the NBC broadcast network posted a slight bump for its 12-game schedule. The network averaged 1.29 million viewers (including streaming), up 4% from last year’s record-low 1.29 million (15 telecasts). That is still the second-lowest NHL average on a broadcast network since at least 2009-10 — and a 17% drop from two seasons ago (1.5M). I don’t dispute anything you posted but the NHL is primarily a regional sport carried on regional and home networks. The real question to ask is why are multi millionaires lined up to pay millions and millions for francises. Vegas just entered and Seattle is on the way. In Nascar lucrative sponsors are running away like scalded dogs and a third of the grid is glorified field filler. Sorry! and here ya are yapping about Nascar on the wrong thread, crawfishing over a bold face lie. Like they say, when your lips are moving your lying. Like Lew said "tax payer funding" get a few big dogs together, bribe the councilmen and bingo another tax payer funded pork barrel appears. In fairness you were speaking of tax payer funded entities on the wrong thread. Speaking of which there would probably be more support for a taxpayer funded stick and ball endeavor up in Picher then something Nsscar related in Charlotte. The NHL is a niche sport that just kills Nascar in total attendance and home viewership. The NHL is rife with optimism with new teams being added and games played overseas. The average Nascar fan is your age, sponsors are leaving like rats leaving a sinking ship and the series gets smaller each year. At best it is a micro niche that gets more micro with each passing day. I have to see a man about a dog today but I will try and check in and see how you are doing periodically. Have a good one and get out and get some fresh air. They make a pretty good point in the article though about the effect Lebron going to the Lakers has had on the ratings. A lot of Lakers games don’t end until around 1am eastern time, he was a lot easier for people to watch when he was in Cleveland and Miami. Also interesting is that the team with the league’s best record is the Toronto Raptors, and Canadian TV markets aren’t included in the Nielsens. They always seem to have an excuse for stick n ball. Without breaking out into an essay, I will summarize it in that stick-and-ball ratings are more cyclical in nature depending on what teams/markets are doing well at the time. That first article is also from midway through the 2016-2017 season, not the most recent 2017-2018 season that finished with increases both locally and nationally. The NCAA Men's Final Four also rotates between CBS (odd years) and TBS (even years) so that'll also fluctuate up and down from year to year. Tsk tsk, such an agenda, such hateful exaggeration and hyperbole. I can't imagine why someone who loves mainstream sports like NHL and NFL comes to a racing fan site to tell us racing is less popular among the masses. We don't care about that. Racing fans are comfortable deciding what we like without needing the stick-and-ball masses to validate that it is good. Stick and ball ratings definitely have ebbs and flows where Nascar’s elevator has gone one way for many years. All I’m saying is that it is incorrect to call Nascar a niche sport. It is correct to call the NHL a niche sport though. The reason for this is that the NHL, while small potatoes, is large compared to Nascar. None of this should upset you in the least so why does it? I guess this is for the whole week now. Anyways, big weekend for college football. @StandOnIt what do you think about Seattle being awarded an NHL franchise at a cost of 650 million? Not bad for a niche sport eh? Great so that many people saw Georgia do what teams from Georgia do and that’s choke away a win. Awesome. I'm excited you? Your quite a seat counter I hear. not to worry though more taxes will make up the difference. I thought that both @StandOnIt and @LewTheShoe might want to read a little about what a niche sport should look like. 12 million Americans watched that shitshow last night on Fox? And another million on NFL Network? The Jags are on my no watch list this year so I was not one of the millions that tuned in. I turned it off in the second quarter. Team has finally broke me. FLRacingFan, IanMcVittie and LewTheShoe like this. Very interesting and it would be good to know the profitability for ESPN2 versus FS1 and NBCS. IDK what ESPN2 carries or the expense involved. Great news about MLS as people ridicule it yet it is showing growth where Nascar is like a helium balloon 5 days after the party.